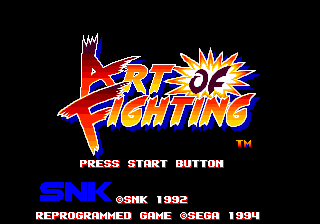 Art of Fighting, known as Ryuuko no Ken (龍虎の拳) in Japan (and South Korea), is a fighting game by SNK, originally released for the Neo Geo MVS arcade and AES home console in 1992. It was ported to, among other consoles, the Sega Mega Drive in 1994. Art of Fighting is the second fighting game to be developed by SNK, following Fatal Fury (which co-exists in the same fictional universe). Art of Fighting is a story-driven fighting game where players control fighters Ryo Sakazaki or Robert Garcia, travelling around the fictional city of South Town in search of Ryo's captured sister, Yuri. The player has to defeat eight other fighters with their own unique fighting styles to finish the game. Unlike later entries, only Ryo and Robert are selectable, though if playing in the two player versus mode, all characters can be controlled. Similar to many games of the genre, there are special attacks in Art of Fighting, called "Death Blows" and "Super Death Blows" — the latter being unlocked through bonus stages. Their execution consume a so called spirit gauge, which when low make the special attacks weaker and slower. The spirit gauge can be refilled by holding either , or . By default, using any sort of controllers, jumps, crouches, holding / can block, / can be used to advance or retreat faster, punches, kicks and + low kick. Playing with a three-button controller provokes the opponent, which depletes their spirit gauge. Pressing and holding briefly causes a stronger kick; pressing and holding briefly will normally cause a stronger punch, though if done close to the opponent, while also holding , performs a body throw. If close to one of the edges, midair performs a triangle jump. Using a six-button controller both , and provoke, stronger punches are done with + , and stronger kicks with , then . To throw the opponent, hold close to the enemy and press . The triangle jump is done with one of the provoke buttons. The use of a six-button controller allows the player to assign and for normal and strong kicks, and for normal and strong punches, plus and to provoke, by changing the controller setup to "Type-D" in the options settings, which makes it easier for playing. Bottle Cut: press at the right time (when the gauge is close to MAX), to cut the necks of five bottles with a karate strike, gaining a spirit gauge boost. Ice Pillar Smash: push quickly to fill a strength gauge and destroy four thick ice sheets, getting a boost to life gauge. Initiate Super Death Blow: perform a "Super Death Blow" for the informed number of times, within a time limit, to unlock it for single player mode. Known as "The Dragon" (Ryuu 龍). Known as "The Tiger" (Tora 虎). Known as "The Old Master". Known as "The Legendary Acrobat". Known as "Kick Boxing Magician". Known as "Call of Death". Known as "Head of South Town". Known as "The Invincible One". Art of Fighting was a significant release for SNK, receiving two sequels in Art of Fighting 2 and Art of Fighting 3: The Path of the Warrior in 1994 and 1996, respectively. Neither of these games were released for Sega consoles, however Art of Fighting's influence can still be seen across numerous 2D fighting games to this day. Characters from Art of Fighting appear in the The King of Fighters series, as well as Capcom vs. SNK and its sequels. Ryo Sakazaki also features as a secret character in Fatal Fury Special. Art of Fighting was designed in part to take advantage of the relatively high technical specifications of the Neo Geo hardware, demonstrating very large sprites and a unique camera system which appears to zoom in and out of play (in a similar manner to what most 3D fighting games achieved some years later). The game also features (some) narration from the chosen fighter in between stages. On the Mega Drive, all of these features are paired back, with the zooming effect removed entirely. Character and background sprites are noticeably smaller and much of the sampled speech is removed, however unlike the original arcade game, the actions can be spread to six buttons. Enemy AI differs between the Japanese and Western versions, with the latter seeing generally stronger opponents. The difficulty in both is paired back from the Neo Geo versions, however. Mr. Big and Mr. Karate are also available in the two player versus mode from the outset in the Mega Drive version. A raster scrolling effect was added for the layer of dust and smoke found in Mickey's stage in the Western version. This was not present in the Japanese release or the Neo Geo original. While lacking the graphical and audio fidelity of its Neo Geo AES counterpart, the Mega Drive version of Art of Fighting, like most Neo Geo conversions of the era, retailed at a much lower price point. Special Thanks: Y.O, Ya Shu!, Ken Kimra, Tabei Chan, Kamata San, Sanjyou, Yamatan GT X, Speaker.R, Wan Wan Pochi Kawai, 68 Freak BBS Z'N, EP82Boy, Atsushi, Sekotch, Stg.Oyaji, Yuritan, Sasa, Nakata21, Kei Fukunaga and... All SNK Staff! Special Thanks: Y.O, Ya Shu!, Ken Kimra, Tabei Chan, Kamata San, Sanjyou, Yamatan GT X, Vow Wow John Kawai, 68 Freak BBS Z'N, EP82Boy, Atsushi, Sekotch, Stg.Oyaji, Yuritan, Sasa, Nakata 21, Kei Fukunaga, Kura San, Oh!Buchi, Jaro, Hirotan, 'Art of Fighting' Team All Staff, and... All SNK Staff! Main article: Art of Fighting/Magazine articles. NEC Retro has more information related to Ryuuko no Ken.